Today I treated myself to a long awaited excursion over to my local Scope City showroom in beautiful and arguably rural Simi Valley, Calif. I headed over in the morning in order to arrive just after the store opened at 10am. I was the only one there, but that was my plan. My goal was to see my new telescope-of-desire up close and personal – the new Meade ETX-LS LightSwitch (LS) telescope. Meade is the first amateur telescope company to offer this long awaited feature – just flip on the power switch and the telescope uses GPS technology to automatically align itself so you can just sit back and start observing. Alignment is a tiresome job, especially when you’re anxious to start observing. Scope City is an amazing place if you’re an astronomy nut like me. I met a very nice and knowledgeable salesman named “Tyler” who stepped me through all of the advantages of LS technology, and compared the new Advanced Coma-Free (ACF) optics with the tried and proven Schmidt-Cassegrain option. The new ETX-LS scopes come in two aperture sizes: 6 and 8-inch. I’m going for the larger size. They didn’t have an 8-inch version of the scope in the showroom, but I thoroughly examined the 6-inch model from top to bottom. I liked what I saw. I found out that the tripod is the same for both models, as well as the mount. The only thing that’s different between the models is the scope itself, and more importantly, the price – my scope will set me back around $2,000, really a bargain when you consider what you’re buying. 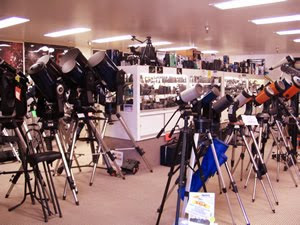 Tyler said they had just sold their last 8-inch the previous weekend, so recession-be-damned, enthusiasts are still buying telescopes. I plan to use a computer software controller with the scope – SkyTools 3 from Skyhound. Coupled with my excellent Canon DSLR camera, I’ll have a very nice rig for doing some cool astrophotography work – do I see an exoplanet in my future? Scope-city is a great place. I bought my meade etx 90 at their Sherman oaks store but I don't think it is still there. I brought my kids over there too and they loved it.